Labor Day is over, school is in; look for more new listings to hit the real estate market this September and October. 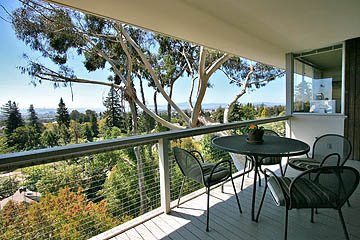 This was my favorite house from last week's broker's tour. Being that my children are older and a big backyard is not necessary for me now, I really like the idea of having a private deck in the front of the house and a deck with views off of the living room. This Reece Clark house was well designed, as the kitchen is very close to the extra large front deck, making entertaining and barbecuing easy. 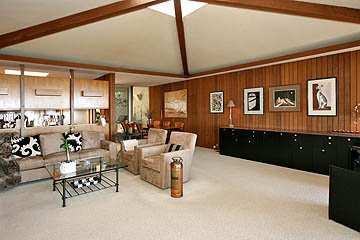 The living room has a beautiful raised ceiling with beams and there are fantastic views from almost every room. This house made me feel like I was in a luxurious tree house! 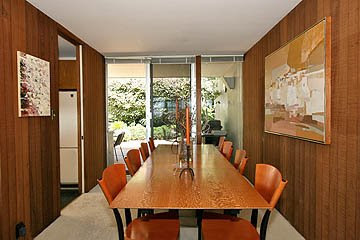 Built in 1962, this mid-century home in Berkeley is in an ideal location; if you lived here you could walk to Peet's Coffee, Rick and Ann's restaurant, Red Bird boutique and Vessel boutique. This home is 148 Stonewall Road in Berkeley and it is currently listed with Grubb Co. Photos are courtesy of Carolyn Jones.